We’ve all memorized those formal rules for arranging flowers — and now it’s time to forget them. Arranging flowers should be fun, not stressful. Here’s a way to arrange flowers that will make you smile and reflect your personal style, minus the anxiety. Forget all of those rules about which flowers should go together and how they should be placed within which specific vase. The only person you have to please is yourself, so grab your flowers and enjoy the process and final product! It doesn’t matter where you buy your flowers. You can get them at the flower mart, a greenhouse, the grocery store or Costco. You can find lovely flowers nearly anywhere. Buy what you like. If roses make you happy, by all means, load up. 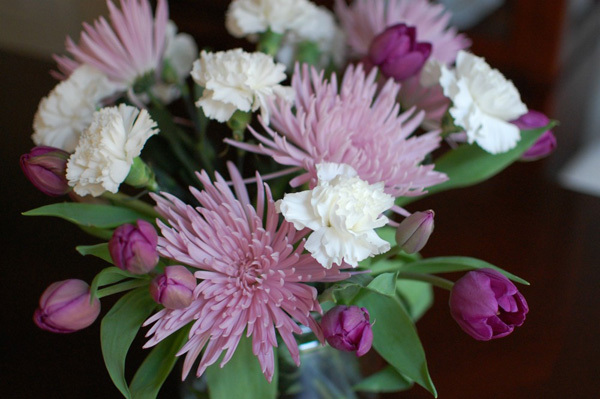 But if the ruffled petals and familiar scent of carnations bring a smile to your face, then you should buy those. Peonies are lovely, but so are chrysanthemums. Choose with your eyes, not by what we’re told are the best. 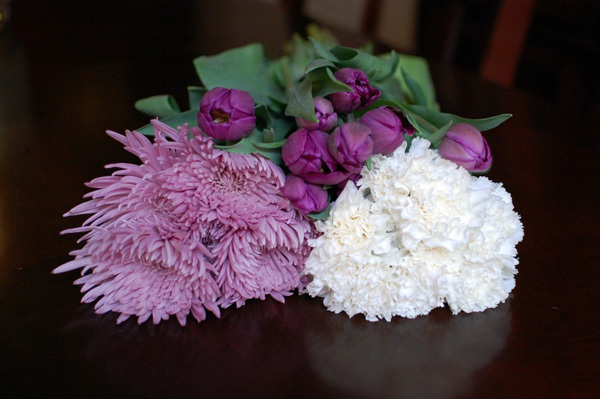 As you can see in my bouquet, carnations can be quite lovely. 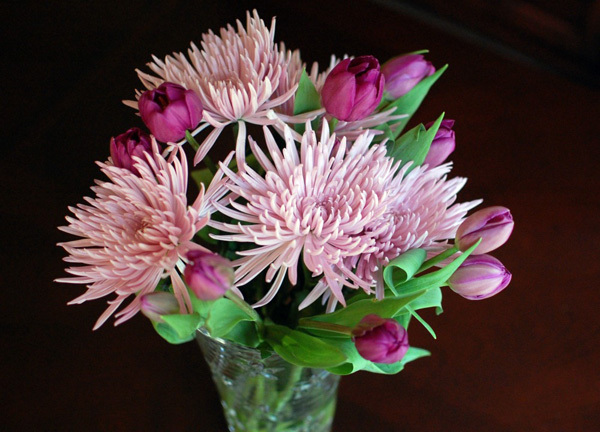 Choose flowers with a tighter bud, as they’ll last a bit longer. 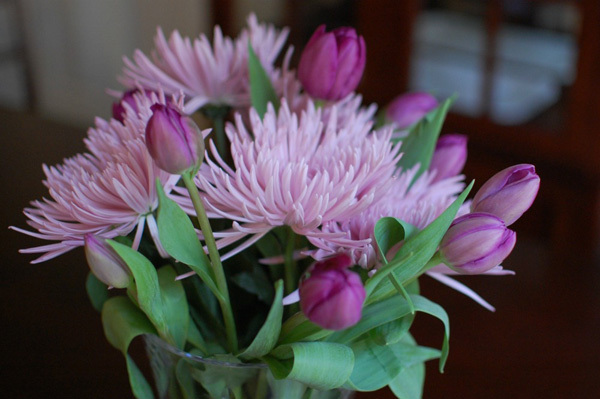 When you get your blooms home, cut an inch off each stem while holding them under lukewarm running water. Cut the stems at an angle to give the flower more cut surface area to drink up the water. Be sure to use a sharp knife for a clean cut. Try different vases, pitchers or buckets. You’ll find that a container can change the entire feel of an arrangement. Any watertight, waterproof container can make a great vessel. In my photos, I used a $5 flour canister from the department store and I also used the Tiffany vase that I got for my wedding. I think both are lovely. You could also forgo the single vase in favor of several smaller vessels grouped together, which you can break up and move around for a different look. Once you’ve chosen your vessel, clean it thoroughly and place a few inches of water in the bottom — just enough to be sure each stem is submerged. Remove all leaves that would fall below the waterline. Soggy, decaying leaves will shorten the life of your flowers. Add the flower food that came with your flowers. Skipping this step will shorten the life of your flowers. I only use part of a packet and save the rest for when I change the water. Though this can be tricky to remember, your flowers will last much longer if you change the water every day. Bacteria begins to grow quickly and creates a slimy mess. 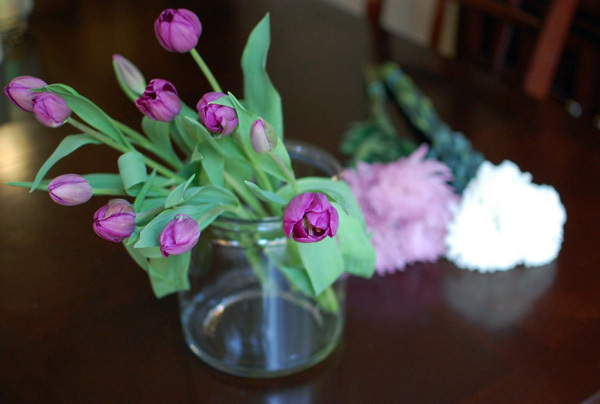 Once you’ve prepped your vase and cleaned the stems, begin to place your flowers in the vessel. Have fun with this step and remember that there’s no one right way to arrange them. If you don’t like how they look, take them out and start over until you’re pleased with the arrangement. I like to go for an informal, imperfect look. 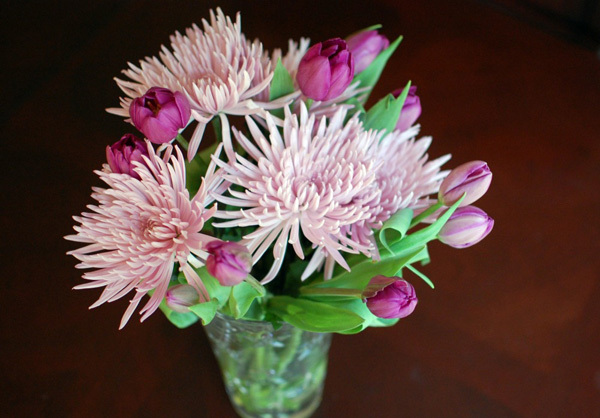 After a few days, you can recut the stems and squeeze a few more days out of your flowers. This is also a great opportunity to try a new arrangement. 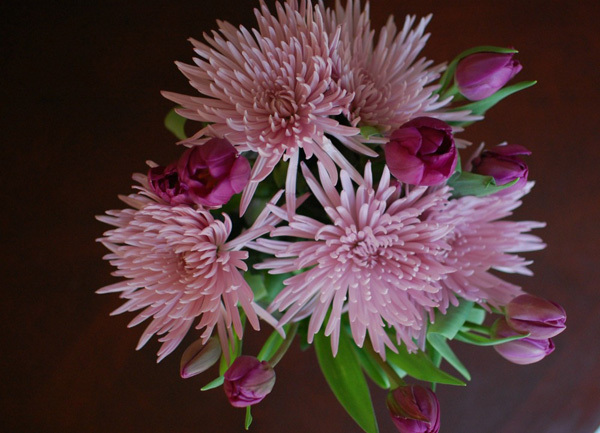 Arranging flowers should be fun, and your final arrangement should reflect your personal style. Have fun with them!